When other thoughts arise, one should not pursue them, but should inquire: 'To whom do they arise?' It does not matter how many thoughts arise. As each thought arises, one should inquire with diligence, "To whom has this thought arisen?". The answer that would emerge would be "To me". Thereupon if one inquires "Who am I? ", the mind will go back to its source; and the thought that arose will become quiescent. With repeated practice in this manner, the mind will develop the skill to stay in its source. When the mind that is subtle goes out through the brain and the sense organs, the gross names and forms appear; when it stays in the heart, the names and forms disappear. Not letting the mind go out, but retaining it in the Heart is what is called "inwardness (antar-mukha). Letting the mind go out of the Heart is known as "externalisation" (bahir-mukha). Thus, when the mind stays in the Heart, the 'I' which is the source of all thoughts will go, and the Self which ever exists will shine. Whatever one does, one should do without the egoity "I". If one acts in that way, all will appear as of the nature of Siva (God). This is an important doubt to clarify. Withdrawing the attention from second and third persons is called antarmukham or introversion, whereas focusing the attention on ‘I’ is called ahamukham or facing selfward. Though ahamukham includes in itself antarmukham, antarmukham does not necessarily include ahamukham. That is, though the attention is withdrawn from external objects, it is not necessarily focused keenly on the consciousness ‘I’. The state in which the attention is thus withdrawn from external objects but not fixed keenly on self is called manolaya (temporary subsidence of the mind), and this state is experienced by everyone daily when they go to sleep. 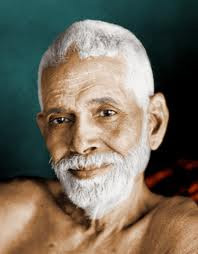 If a person practicing raja-yoga withdraws his attention from external objects by means of breath-restraint and if he does not make effort to fix his attention firmly upon the consciousness ‘I’, his mind will slip into the state of manolaya. Though the manolaya which is thus achieved by the practice of raja-yoga is glorified by the name nirvikalpa samadhi (thought-free absorption of the mind), it is in fact no more helpful to spiritual progress than is the daily sleep experienced by all people. Why is it that self-knowledge does not arise in the state of manolaya? under the tossing sway of vikshepa sakti. By withdrawing one’s attention from external objects, one frees oneself temporarily from the sway of vikshepa sakti. But in order to pierce though the dark veil of avarana sakti, it is necessary for one to attend keenly to the consciousness ‘I’ and thereby know its true nature. That is, since self-forgetfulness is the root-cause for the rising of the veil of avarana sakti, self-attention alone is the medicine which will remove it. “Having given up external objects, the mind knowing its own form of light is alone true knowledge”. How is the ego to be destroyed? This question is a sure way to cherish the ego and not kill it. If you seek the ego you will find it does not exist. When one scrutinizes the form of the mind without forgetfulness [that is, without pramada or slackness of attention], [it will be found that] there is no such thing as mind; this is the direct path for all.